Photo taken looking south toward Green Valley at about 3:pm MST this afternoon. Radar below from same time - storm is just east-northeast of the I-19 sign. Very limited time this morning, so very brief post. Yesterday was, as well-forecast by models, a down day for the low elevations and metro Tucson. The CG flash plot above (from Atmo and Vaisala) and the ALERT data below both illustrate this. Storms stayed on Catalinas, south end of Tucson Mountains, and Keystone Peak to the southwest of the city. Two stations up in Catalinas reported over two inches of rain yesterday. The morning sounding (below) from TWC has dried considerably but remains wet with 1.64" PW and some afternoon CAPE - if boundary layer can heat and mix to around 700 mb. Very light winds continue below 300 mb but strong south winds above. Mountains should be active again today, while there may be anvil shading problems at many lower elevation sites, storm tops and anvils lean toward the north. There will be much more sunshine and heating today over southeastern Arizona. Both 06 UTC WRF forecasts from Atmo indicate increased storm activity but with most rain over higher elevations. Looking south toward Atmo at 2:30 pm MST yesterday afternoon, where heavy storm storm core struck for second day in a row (as per comment by Stefan, below). ALERT data for 24-hours ending at 7:00 am this morning above - the report of 1.91" is about where photo at top was looking. While Atmo and TUS had 0.71" and 0.87" respectively, we had thunder but only 0.07" of rain. ALERT data for past three days below shows the dry area has been here in north-central part of City. The vagaries of storm core rainfall are emphasized when there are no winds aloft. While the airport has had 2.21" of rain the past 2 days, Davis Monthan ASOS reports only 0.13" - less that 5 km apart. Further, the ALERT gauge at Craycroft and Golf links has had over an inch and a half of rain - this gauge being less than a km from the DM ASOS. Finally, a very severe thunderstorm struck in the Luke AFB area northwest of downtown Phoenix yesterday (Luke had 1.47" of rain with gusts to 56 mp - but one of their nearby mesonet stations measured 83 mph and there was considerably damage in area near the base (PHX was basically skunked again). Detected CG flashes for 24-hours ending at 7:00 am shown above (with hours ago timeline to left). CGs show the storm cores near Atmo and TUS (from Atmo and Vaisala). The plot of solar radiation from Atmo (below) shows that turned very dark there as the storm cell developed overhead. Out of curiosity I looked at the 06 UTC GEFS plumes for QPF this morning (below) - different member have much different forecasts, as would be expected, but of interest is how much wetter the operational GFS (blue) becomes at the end of the period. Tropical sounding again at TWC this morning with almost no winds in the troposphere, heavy cloud cover, and almost 2 inches of PW. Visible satellite image above is from 6:45 am and shows very widespread cloud cover across Arizona (with some showers to our south) this morning. I would certainly expect a down-day today after two big events and extensive cloudiness, and this is what the WRF models forecast from 06 UTC last night (below is precipitation forecast from WRF-GFS through midnight tonight). However, little seems to have gone as expected last week or so, and we'll see what today actually brings. Basically my brief look at today went terribly awry. 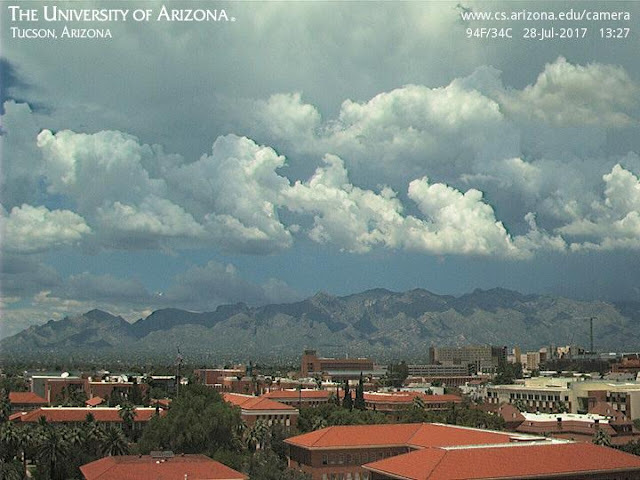 Storms already over the Catalinas - above - before 11:00 am MST. By 2:00 pm storms in the metro - as per 1:51 pm radar just below. Intense storm over campus at 2:00 pm - bottom. Will take a closer look at all this tomorrow. Another nice sunrise along the Rillito, which was flowing robustly this morning. The 12 UTC 500 mb analysis below (from NCAR) shows that the pattern has frankly just gone to crap. There are numerous, very weak anticyclone centers with troughs between. I see possible anticyclone circulation centers over: eastern Nevada; northeastern Colorado; northeastern Oklahoma; and far southern Texas near the Rio Grande - what a mess. Also note the unusual cold temperature at Tucson of -8 C.
The 12 UTC TWC sounding plot (above) continues very moist and indicates some CAPE, centered around that cold, in-cloud 500 temperature. The 06 UTC WRF-GFS forecast sounding for TWC (below) is valid at 4:00 pm MST. Wind profile is chopped up and perhaps with speeds a bit high? The 500 temperature has warmed to -5 C and there is little CAPE. So it's very hard to tell if there will much activity in eastern Pima County at low elevations. Will take a lot of things coming together to move storms far off the mountains. 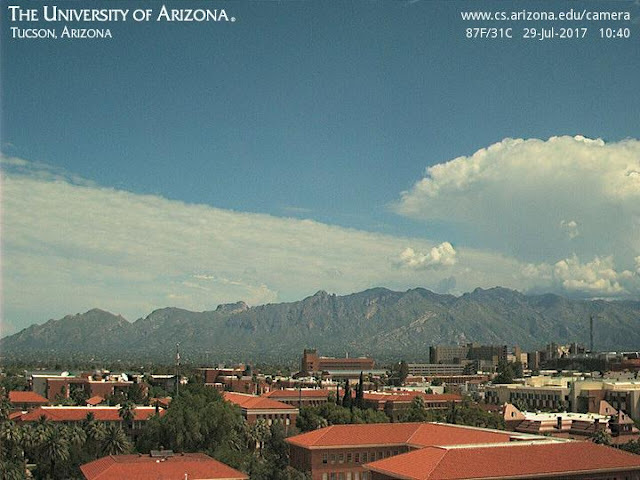 Storms began forming early afternoon yesterday, as shown in this view of the Catalinas at about 1:30 pm MST. Storms moved more slowly than I'd expected and were not well organized - this led to several spots with very heavy local rainfall, as per ALERT plot above for 24-hours ending 7:00 am. The heavy rains correspond well with the CG clusters shown in plot below (CG flashes for 24-hours ending at 6:00 am this morning - from Atmo and Vaisala). We were between several cells here and only had thunder and 0.15". Note 11 ALERT sites with over an inch and 1 with over two inches. Airport had 1.34". The evening sounding from TWC (above) shows that the nice morning wind profile had deteriorated significantly, explaining the observed storm behavior. The T/Td time series from Atmo shows a T drop of almost 30 F, while they were receiving 0.61" (below). Yesterday was mostly anvils here in metro area with strongest storms to our east. 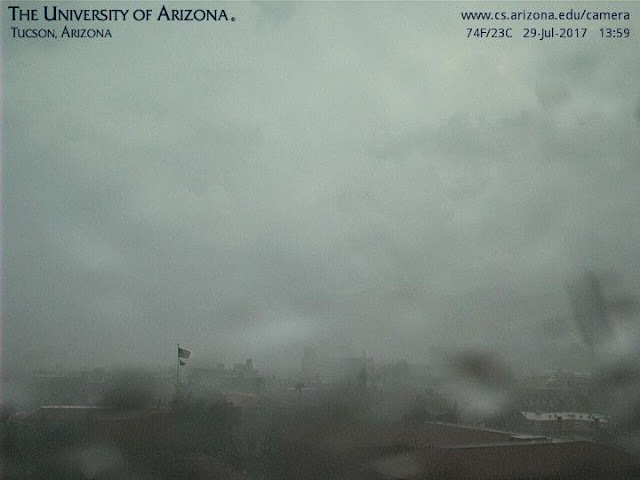 However a strong outflow moved across low-elevations between 7:00 to 8:00 pm MST, with a few rumbles of thunder and light showers into early morning hours. The ALERT plot above is for 24-hours ending at 7:00 am this morning. Here at house there was 0.08". Rain amounts at several RAWS sites to our east were right around 1 inch. Guthrie reported a gust to 74 mph during the storms - accurate? The 00 UTC sounding from TWC below had slight CAPE and a wind profile continuing to support anvil spread to west from storms. This morning's TWC sounding has changed significantly, partly due to storms and partly due to an anticyclone shift some to north and west. The wind profile (above) shows a shear profile above afternoon cloud base that is very favorable for organized and possibly severe thunderstorms, and much faster movement toward west. However, considerable heating will be needed. The morning 500 mb analysis (from NCAR, below) shows a bean-shaped anticyclone centered around the Four Corners and a distinct inverted trough that's nearly overhead. This morning's NAM forecasts move this feature very slowly during next 24-hours while keeping it very active. The 7:00 am visible satellite image - second below - shows heavy cloud cover over most of state, except for southeastern Arizona - certainly appears favorable for sunshine and good heating. Finally, considerable MCS activity moved over the middle and upper GoC last night and early this morning - above is IR image from midnight. This seems to have led to a significant moisture surge at Yuma early this morning with a temperature drop, dewpoints increasing from 50s into 70s, and strong south to southeast winds. The early morning VAD wind profiles from Yuma radar indicate strong winds up to 6,000 ft above the radar. Think this may be the first surge profile this deep and strong so far this summer. What's Wrong With NWS "Happening Now?" The NWS often posts a "Happening Now" graphic on their web page, as per above. The problem with these is that convective storms both develop and dissipate rapidly. The graphic above was still "live" on the NWS page at 4:45 pm MST this afternoon. Compare with the TUS composite radar (below) from 4:14 pm. Thunderstorms and light showers returned to high elevations in the Catalinas yesterday - ALERT data above for 24-hours ending at 7:00 am MST this morning. The morning sounding (below from SPC) indicates decent CAPE if the BL mixes well to a bit above 700 mb - which would require a high at airport of around 104 F. The wind profile however is not very favorable and would tend to bring anvils over city, keeping the temperature down a bit. The 06 UTC WRF-GFS from Atmo forecasts just sprinkles for the metro area through midnight (above). The forecast sounding for TWC at mid-afternoon requires some outflow lift to produce thunderstorms. The winds at high-levels increase some and become more easterly, increasing the threat of anvils over the city. However, the surface plot forecast for 5:00 pm this afternoon (below) indicates a strong outflow from southeast moving across city. The model forecasts decent heating until about 2:00 pm before anvils increase over low-elevations. So mixed signals for this afternoon and another wait to see day. The IR image at bottom is from 07 UTC last night. There was significant thunderstorm activity over the middle and south end of the GoC last night and this may begin pushing extremely moist mT air north again. Little to report this morning. Closest storm and rainfall activity moved from Sonora up over the Huachucas early evening and have hung around the mountains all night. Totally down across Pima County. The 13 UTC MIMIC total PW (above) shows PW holding around 1.5" across southern Arizona while very high values reach north to around Guaymas and Hermosillo. 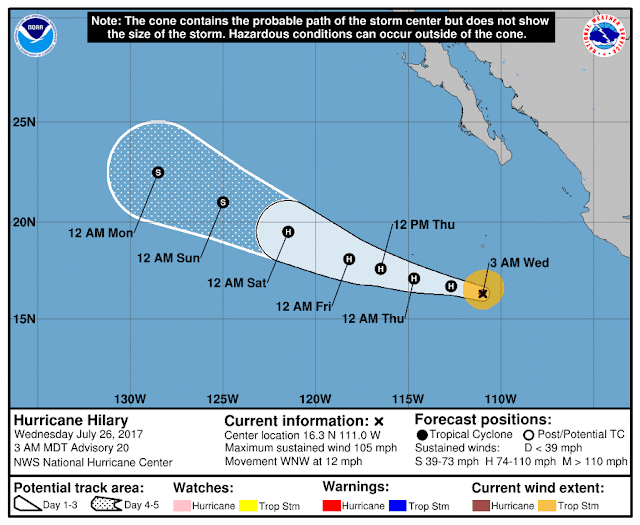 Hurricane Hilary is at about 16N, south of Baja. The Rillito at Dodge USGS stream-flow gauge (below) showed three distinct peaks during the past week, with one on Thursday evening nearly reaching 5,000 cfs. 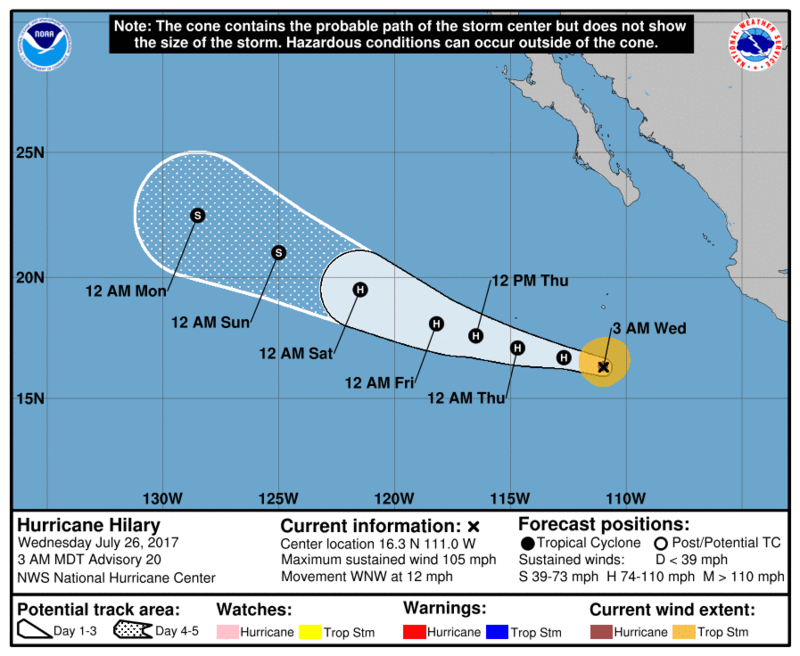 The morning NHC forecast for Hilary is shown above and keeps the storm far west of south tip of Baja. However, the operational version of the GFS turns the storm northward. This is indicated in the 00 UTC WRF-GFS forecast of 850 mb winds and PW below. Compare the forecast locations of the storm for next Monday morning (the 31st). Models were very good yesterday in forecasting the downturn to continue. Much different picture yesterday for detected CGs above (from Atmo and Vaisala) for 24-hours ending at 6:00 am MST this morning, as thunderstorm activity was much reduced. Precipitation for same period (below from ALERT) across metro area was focused around the airport - TUS reported 0.49" while we had just 0.01 here from light afternoon sprinkles. The morning TWC sounding (above) remains very moist and continues with some CAPE as the BL mixes more deeply this afternoon. However, nearly unidirectional wind profile means anvils heading out ahead of any mountain storms that would develop, hindering their advance toward lower elevations. Warm temperatures continue in middle levels. The WRF-GFS from midnight run last night (below - valid through 6:00 am tomorrow morning)) forecasts little rainfall over southern Arizona, as the downturn continues. The trough off California does not shift further south, and PW remains high, which is good for a return to better conditions as the 500 high builds again and shifts back to Four Corners/Great Basin region. The GEFS 500 mb spaghetti plot at bottom shows the longer term adjustments to large-scale pattern (valid at 216 hours - 00 UTC on August 3rd).